Inspector-General of Police Joseph Boinnet gives a press briefing at Jogoo House in Nairobi on January 15, 2018 following the DusitD2 hotel attack. Nairobi — The death toll following the Riverside Drive terrorist attack has risen to 21 after six more bodies were retrieved from the complex on Wednesday evening. Of the dead was a police officer who succumbed to injuries while undergoing treatment. 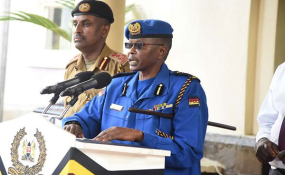 Inspector General of Police Joseph Boinnet in a late night press briefing told journalists that 28 other people were admitted to various hospitals where they were receiving treatment. Of the dead, the IG said, 16 were Kenyans, an American, Briton and three other victims of African decent who were yet to be identified. Already, police have arrested two people whom they believe facilitated the Tuesday afternoon attack at the complex housing the dusitD2 hotel and several other office buildings. One suspect was arrested in Ruaka inside a house where a terrorist was living since November last year. Another one was arrested in Eastleigh Estate. "They are being held in police custody," the IG said. Director of Criminal Investigations George Kinoti took over the probe that will help pin down those who might have facilitated the attack. It has emerged that the five attackers, who were all killed by Special Forces, had frequented the complex weeks before they executed the attack. On Wednesday, families flocked to the City Mortuary for viewing and identification of bodies in an exercise full of emotions.